This post is a two parter and I admit, the first part is seemingly opposed to the second part - but when you read the 2nd part you will realize why the two are linked. Avoid making sudden moves. It only scares them away. Keep an abundance of less tasty food nearby so that the squirrels are well fed, but will enjoy any food you have even more so. Use a gentle hand in handling squirrels. Make a soft chirping sound with your mouth, like in the video below. 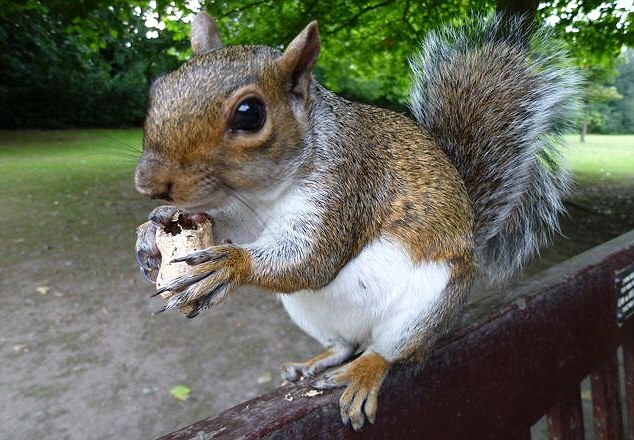 Remember the squirrel's primary goal is going to be food, the tastier the better. You are not so much a friend as you are a source of food. Always check your local hunting regulations before going hunting to make sure you follow the letter of the law. Learn how to befriend squirrels. See, I told you the two things were linked. Makes it much easier to get closer to them and they stand more still if they are not running away in fear. If bowhunting, use blunt arrowheads. Preserves the internal organs better, less messy and you can salvage the fur to use for other things. 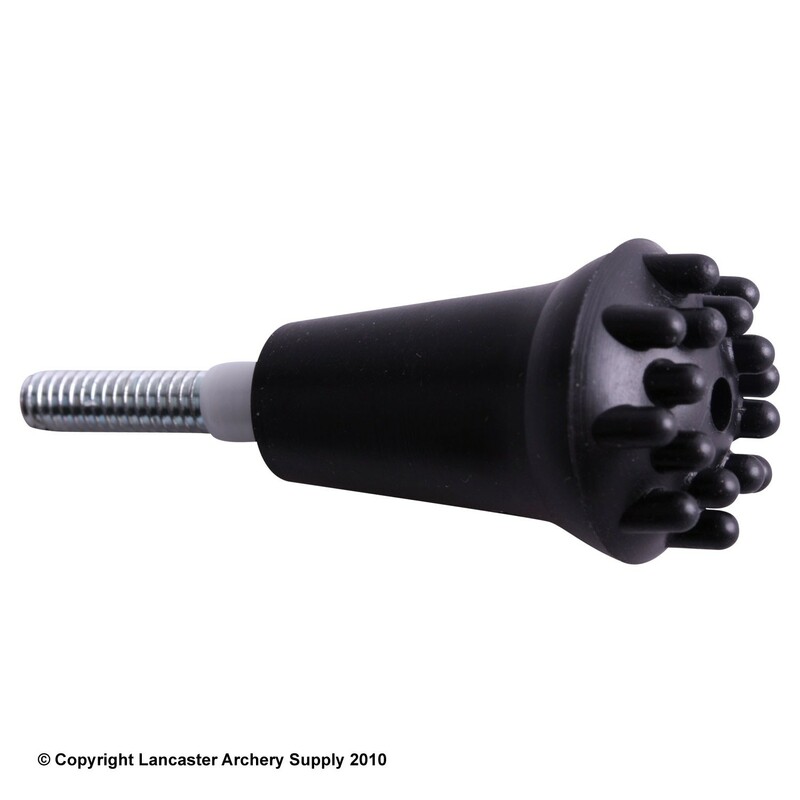 A normal broadhead basically rips right through the squirrel and can end up mixing the guts with the quality meat, ruining the taste. I recommend the rubber blunts as they do a better job of keeping the fur in good condition. The metal blunts sometimes have sharp edges which can tear through the fur. Also for bowhunting, large 2" fletching (sometimes called flu flu fletching) is easier for you to find your arrows in case you miss. Large brightly coloured fletching is easier to find in thick brush. If using a firearm, stick to low calibre ammo. Smaller the better. Anything too big is basically overkill and can end up ruining the meat. Practice shooting at random distances (eg. field archery) between 5 yards and 30 yards. Practice shooting uphill and downhill at targets placed at random distances. Practice shooting at moving targets. Practice shooting at targets in trees. (This is actually harder than you think.) A good sport that hones this particular skill is Popinjay. Go Google it. 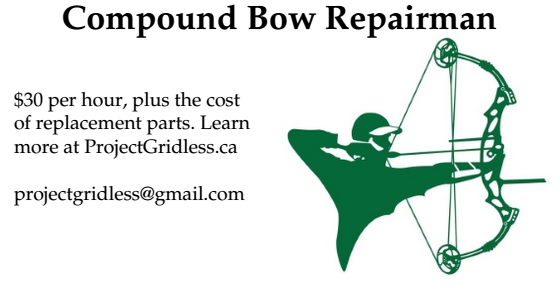 If you are worried about losing or breaking arrows, use old arrows that are already slightly damaged that you are not worried if you lose them. As long as they are still reasonably accurate they will do the job. If you lose or break them, oh well. If you can catch the squirrel out in the open away from trees, your chances of hitting just improved dramatically. So if you can lure the squirrel out in the open, good. Try to get a good angle if there are trees or brush in the line of your shot so that you can avoid your arrow from hitting a tree or branch. Be patient. You may miss a few shots before you successfully hit one. Avoid taking any really dumb shots because you think you might get lucky. A failed shot will just scare the squirrel away. Some people who hunt squirrels also carry a "stun stick", basically a small club for smacking an injured squirrel in the head in order to finish it off faster. Learn how to spot and listen for squirrels in thick brush. eg. Sometimes you can hear them chewing on a nut and rustling around. Do NOT wear sunglasses, they may defeat your ability to notice a squirrel and correctly place your shot. Later in the season the squirrels are more likely to be on the ground as most of the nuts will have already fallen, so that is a good time to hunt. Windy days are better. Squirrels cannot hear that well on a windy day. Bowhunting squirrels is actually good practice for stalking deer and similar large game. A squirrel's main torso is roughly the same size as a deer's heart/lung area, and the distances you would be shooting at them are roughly the same. Some people really LOVE the taste of squirrel. It apparently tastes a bit like rabbit, pork, lamb and chicken (depending on who you ask). The meat is very high in protein and low in fat, which makes it healthier than many meats you will find in your local supermarket too. 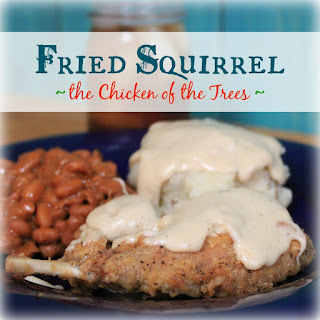 Fried Squirrel - "The Chicken of the Trees"
Note, use only young, tender squirrels for frying – save old squirrels for making squirrel dumplings. Serves 3 – 4 people.